INDIANAPOLIS, Ind. — Texas A&M AgriLife Extension Service has approved the inclusion of new MezaVue® herbicide in its recommendations to control pricklypear cactus. The addition makes MezaVue eligible for funding in state and federal cost-share programs in Texas. Corteva Agriscience™, Agriculture Division of DowDuPont, introduced the new herbicide in September 2018, after four years of research trials and large-scale demonstrations. First commercial applications are expected in early 2019. MezaVue provides early visual signs of activity and a faster, higher level of control than other products used in aerial applications on pricklypear. Prior to MezaVue, the process of showing symptoms of plant death could take three years or more. With three active ingredients, MezaVue causes a distinct yellowing of pear pads within three to four months of application. 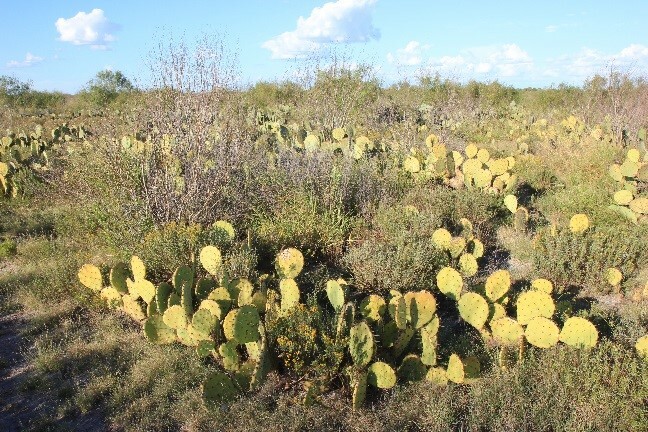 “Pricklypear is associated both with loss of grazing and animal health problems,” said Dr. Charles Hart, a rangeland ecologist and Corteva Agriscience Market Development Specialist. University researchers have documented that during drought, pricklypear density can increase 25 to 30 percent each year while other plants decline. At that rate, pricklypear density doubles every three years. For more information on state and federal cost-share programs, Hart encouraged ranchers to contact their local office of the USDA Natural Resources Conservation Service. Pricklypear is susceptible to MezaVue when the air temperature is above freezing and the plant can be adequately covered with herbicide. The recommended broadcast rate of MezaVue® herbicide is 32 ounces per acre. The herbicide should be carried in at least 20 gallons total volume for ground application or 5 gallons by air. For individual plant treatments, the recommended herbicide concentration is 1 percent. Four months after aerial application with MezaVue® herbicide, pricklypear is already yellowing, a sign the herbicide is working. Without control, the density of pricklypear can increase by 25 percent to 30 percent per year, doubling its canopy in three years. Follow Corteva Agriscience on Facebook, Instagram, LinkedIn, Twitter and YouTube. Follow Range & Pasture at Corteva Agriscience on Twitter.